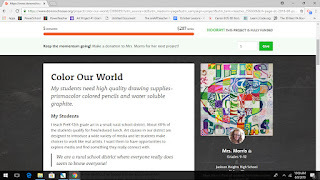 Adventures of an Art Teacher: Get started with Donors Choose ASAP to Earn a $50 Donation! Get started with Donors Choose ASAP to Earn a $50 Donation! I'm sure you've heard of Donors Choose by now- the online platform that lets teachers post projects with supply requests for their classrooms and lets people who want to help your students donate money to the project- but maybe you've never tried it. This is a great time to start! From August 5-10 only, teachers who submit their first classroom request on DonorsChoose.org will receive a $50 kickoff donation to their project! I've had 10 projects funded in the last 4 years including books, furniture, technology, and art supplies and it has been awesome to be able to supplement what I can provide with my budget.